Nov. 18, 2017 5:57 p.m. The search for missing women in the North Okanagan and Shuswap took to the skies on Saturday, Nov. 18. 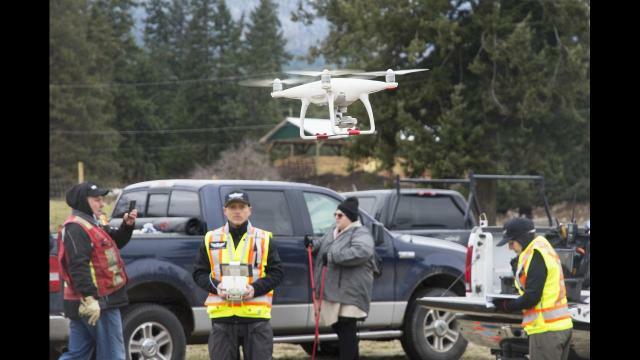 The efforts of a group of volunteer searchers were supported by drones operated by Sky Crew Aerial Imagery from Salmon Arm and Crystal Mountain Aerial Media from West Kelowna. The drones provided the search team with a bird’s-eye view of areas of interest in the cases of missing women Caitlin Potts, Deanna Wertz, Ashley Simpson and Nicole Bell. Among the searchers were Bell’s parents Dennis and Jane Aubertin, who said they are very grateful for the efforts of the search team. Bell was last seen in Sicamous on Sept. 2. Her cell phone was later found in Salmon Arm. Ty Kelsey and Tavia Grabas from Crystal Mountain assisted searchers at a property located on Watson Road in the Yankee Flats area. Mira Schenkel, the owner of the Watson Road property said she was happy to allow the searchers to use her land. Schenkel met John Simpson, Ashley’s father when he was in the area searching for her this spring — she never met Ashley, who lived nearby before her disappearance. Jody Leon, who organized the search, explained the property is a good place to launch drones from because it is near the area where Deanna Wertz and Ashley Simpson went missing and it is also located just northwest of the Sagmoen farm where the remains of 18-year-old Traci Genereaux were discovered by the RCMP in October. Leon also organized a gathering on Thursday evening to mark Ashley Simpson’s 34th birthday. Dakota Lalonde from Sky Crew assisted another team of searchers who focused on a wooded area near Springbend road north of Enderby which the RCMP confirmed they searched on Oct. 20 and 21.